The first digit, or the “big toe,” is usually involved with the pain occurring as a result of abnormal pressure from the nail borders against the soft tissue of the toe. A nail that is highly curved or one that is excessively wide can create pain related to increased pressures of the nail against the soft tissues around the nails. 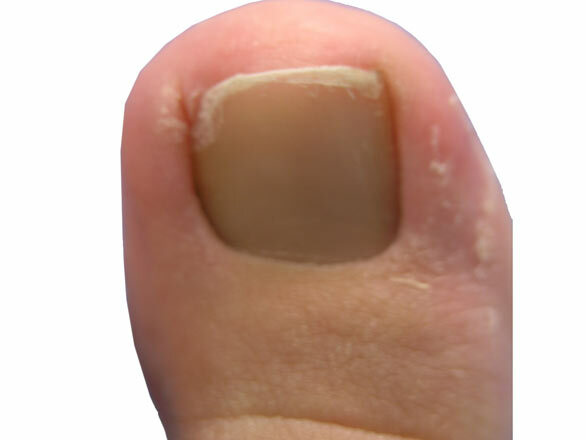 Ingrown toenails are seen in children and adults. If enough pressure from the nail occurs, the soft tissue of the nail fold can develop a small sore which can allow bacteria to penetrate the soft tissues creating a local infection or “paronychia”. The paronychia will often create redness, swelling, increased warmth and noted drainage at the level of the nail fold. Many patients however may not experience paronychia but will have chronic pain that has been present intermittently over a long period of time. Patients with intermittent pain related to ingrown toenails often times will trim the nail back aggressively on their own which will relieve pressure at the nail fold and thus relieve pain. Patients who develop paronychia however, will often times be placed on oral antibiotics and warm water soaks by primary care physicians and pediatricians. Most of the time oral antibiotic use does very little to resolve the local infection because the pressure of the nail against the soft tissue in the nail fold is the main culprit. Patients with paronychia typically require a minor office surgical procedure to remove the offending nail pressure which will allow a speedy recovery without the use of oral antibiotics. The minor surgical procedure or nail avulsion involves numbing the toe with local anesthetics and then using an instrument that resects the ingrown portion of the toenail. After the procedure a surgical dressing is applied to the toe and warm water soaks are performed for up to five days following the procedure. The toe heals within 5-7 days but pain relief is noted immediately. After the partial avulsion the nail will grow back fully within 6-9 months. Many patients who had a partial nail avulsion will need a permanent removal of a portion of the nail after the nail regrows to prevent long term pain and additional infection episodes. Patients who experience chronic pain associated with ingrown toenails or patients who have had multiple paronychias can elect to undergo a minor nail surgery called a matricectomy procedure. The partial matricectomy is a procedure that removes a small portion of the ingrown toenail permanently. This procedure is performed just like the partial nail avulsion but a chemical is applied to the nail producing tissue or nail matrix. The chemical called phenolic acid creates a burn to the nail producing tissue which will prevent the nail from regrowing. Complications associated with this procedure are minimal with a 10% chance of recurrent nail growth despite the application of phenol, minor infections and delayed healing. Infection rates are less than 5% and are treated with oral antibiotics if needed. Expected healing time is anywhere between two and four weeks after the procedure. Discomfort after the procedure if any is generally well managed with ibuprofen or naproxen. Despite the discomfort associated with having a nail procedure the pain relief obtained after the procedure is very marked with patients happy to have a permanent relief of pain related to the ingrown toenail. Information on soaking your foot after a toenail procedure, which will aid in the healing process by removing nonviable nail bed tissue as well as decreasing your chances for post procedure infection. Phenol and alcohol chemical matrixectomy. Segmental phenolization for the treatment of ingrowing toenails: a review of 6 years experience. Derma-Gel® Hydrogel Wound Dressing helps create a moist wound environment but does not adhere to the surface of the wound bed and will not liquify in the wound. This highly absorbent product also helps protect the wound from bacteria and fungi. Soft, flexible and cushioning cover for bony prominences or abraded skin. Change dressing every 2-5 days as needed. These bandages are woven to allow for stretch and breathablity around the wound. Each bandage features a non-adherent island pad and provides even adhesion.